Reprinted by permission from StrongerTogether.coop. Find more recipes and information about your food and where it comes from at www.strongertogether.coop. Heat 1 tablespoon olive oil with the butter in a large stock pot over medium-high heat. Add the onions and sauté 5-10 minutes until onions are soft and translucent. Add half the minced garlic, and cook another minute, then add the vegetable broth and bring to a boil. Add the peas, return to a boil, and simmer for 1-2 minutes. Remove from heat, then stir in the green onions, mint, sour cream, and a pinch of salt and pepper. Puree the soup in a blender until smooth. Taste for salt and pepper. To make the pesto, put the parsley, mint, garlic, pine nuts and lemon zest and juice in a food processor and blend until smooth. Add the Parmesan cheese and blend. Slowly drizzle in the olive oil until blended well. 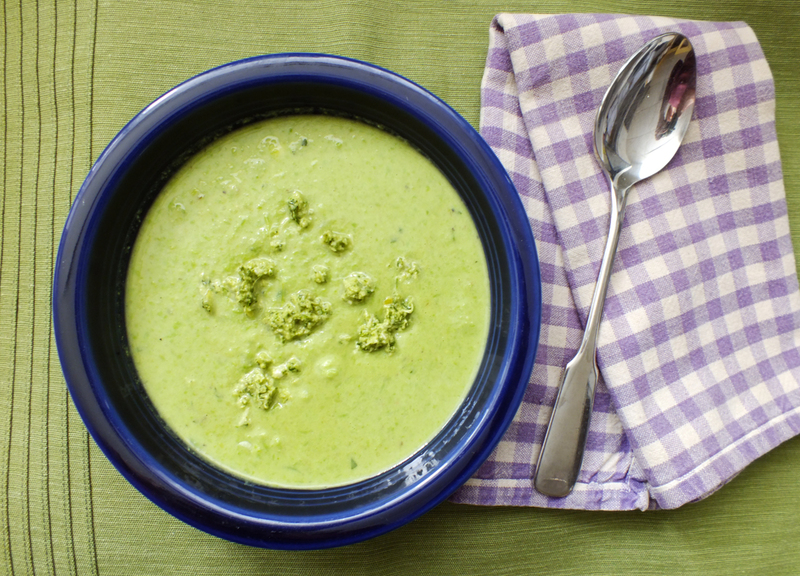 Top each bowl of soup with a large spoonful of pesto, and serve warm or chilled.